To book you can call us at: 1-800-842-6943, or you can email us at: mytravel@platinumholidays.com. Istanbul: One part of Istanbul is situated in Europe and the other is Asia. This is divided by the Bosphorus Strait. 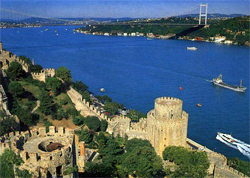 It is also bounded by 2 seas on the north and the south, the Black Sea on the north and the Sea of Marmara on the south. Istanbul is the backbone to the economy of Turkey. It has some of the most beautiful architectural monuments to view. On arrival our representative will assist you with your transfer to you hotel. Rest of the day is at Leisure. Overnight stay at your hotel in Istanbul. Blue Mosque: Also known as Sultanahmet Mosque which dominates the skyline in Istanbul. The Blue Mosque is said to be the most beautiful mosque in the world and one of a few which has six minarets. It marks an attraction along with the beautifully arranged cascade of domes. The mosque got popular name "Blue Mosque" due to its ceiling inside which is lined with 20,000 blue stones. Hippodrome Square: It is Officially known as Sultanahmet Square which earlier was a horse racing place and a social centre for the public of Constantinople. It has some great monuments to look at like the Egyptian Obelisk, The Serpentine Column and The Column of Constantine Porphyrogenetus. The St. Sophia Church Museum: It was earlier a Cathedral Church which was burnt down during an uprising and then was rebuilt during the region of Theodosiss II which was again destroyed by fire and there by again rebuilt by empress Theodora after the apprising had been suppressed. The Museum is said to have some beautiful Mosaics work which is a must see. According to research the structure is rested on a bed of rock. 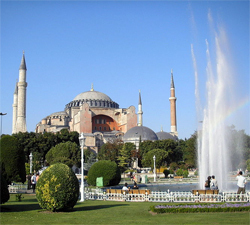 It is also known as "Hagia Sophia". The Topkapi Palace: It was a primary residence for the sultans of the Ottoman Empire for about 400 yrs. It could house about 4000 people at any given point in time. It was a self contained city with its very own mosque, bakeries, library, hospitals etc. once the Ottoman empire came to an end the place was turned into a museum. It has some great collection from that time period. 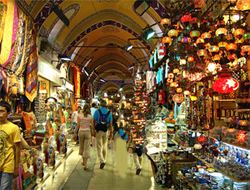 The Grand Bazaar: Considered the largest and the oldest covered market in the orld. Also considered a massive and historic shopping area with a variety of goods like Leather, Jewellery, Local Crafts and Artifacts, Clothes, Spice and Antiques. Evening is at Leisure. 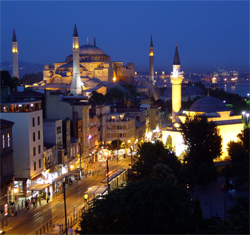 Overnight stay at your hotel in Istanbul. After breakfast today morning take a flight to Izmir (Smyrna). The journey is about one hour. Archaeology Museum: It has an impressive collection of ancient and roman sculptures & artefacts recovered from area excavations like Bergama, Lasos, Bayraki. The museum presents a beautiful journey through Aegean history and an art culture spread over the last 5000 years. Roman Agora: It was an open air market constructed during the rule of The Alexandra the Great. After a massive earthquake in 178 AD the agora is mostly in ruins. This agora was excavated by 2 archaeologist from Germany and Turkey between 1932 & 1941. Later take a walk by the, Sea Side Street and Alsancak. 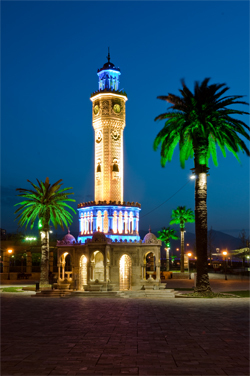 Evening is at Leisure: Overnight stay at your hotel in Izmir. Start your day with an early breakfast. After breakfast drive to Bergama. The journey is about one and a half hour. 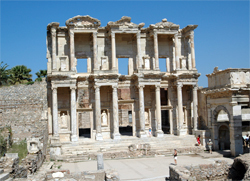 Bergama: It was well known in Hellenic and Roman times for its great library and medical centre. 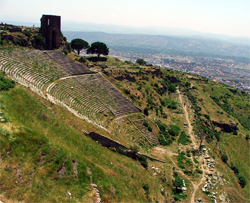 It is the ancient Pergamum city. 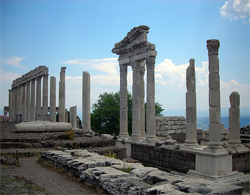 Pergamum Acropolis: Was an ancient Greek city in the modern � day Turkey. Located at about 16 miles from the Aegean Sea. It has a great temple and a dramatic theatre which are viewable anywhere from the city. The Athena Temple: Surrounded by olive groves situated on top of the city. 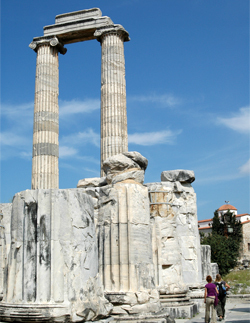 The temple has a total of 19 columns, built in a pure Ionic style. Asklepion: Home of the Galenos and a medical healing centre of the ancient world which was built in the honour of Asklepios who was the God of healing. It was also the world's fist psychiatric hospital. Pergamum Museum: Contains a fraction of artifacts as most of it was taken away by German archaeologist. But the museum still has some notable objects to take a view at. It also has some beautiful mosaic work displayed. After your tour return back to Izmir. Overnight stay at your hotel in Izmir. After breakfast drive to Sardis. The journey is about 2 hours away. Sardis: Ancient Sardis had a large and wealthy Jewish community. It now lies in ruins and is an archaeological site. It is now known as Sart. 3rd Century Synagogue: Provides evidence for the continued validity of the Jewish community in Asia. The synagogue includes magnificent mosaic floor, walls and columns work. It also has over 80 Greek and about 7 Hebrew inscriptions. Temple of Artemis: It is the 4th largest Ionic Temple in the world originally built in 300 BC by the Greeks. After your tour proceed further to Pamukkale. The journey is about 2 hours. On arrival our representative will assist you to your hotel. 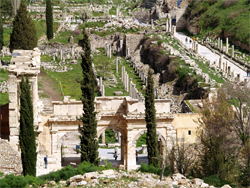 After check in take a visit to Hierapolis. 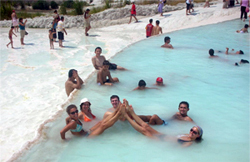 Pamukkale Hierapolis: Meaning cotton castle in Turkish. According to the Turkish it is the world's 8th wonder. The water that flows down the cliff turns the area into white as cotton colour and carves a fantastic formation of stalactites and basin making an unreal landscape. Dinner and overnight stay at your hotel in Pamukkale. After breakfast drive to Laodicea. Laodicea: Is an ancient city which was destroyed by an earthquake and there after never rebuilt. Famous for its woollen and cotton clothes and hence became a prousperous Roman market. Remnants of the ancient city include a stadium and an amphitheatre. After your visit drive to Aphrodisias. 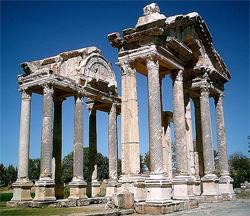 Aphrodisias: One of the oldest and sacred places in Turkey which is dedicated to the Greek Goddess. It was also the home of renowned school of marble sculpture. In the Greek times the site was also dedicated to Aphrodite, the Goddess of love and fertility. Large stadium: One of the largest and best preserved of its type in the Mediterranean. Holds a capacity of 30,000 spectators at any given point of time. It was specially designed for athletics contests but was damaged by an earthquake in the 7th century. Now used for games, circus, wild beast shows and many more. 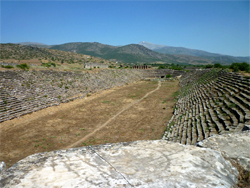 Agora: it was a large public market place in the northern part of Aphrodisias. The structure mostly hosted musical events. It was later used for public speeches and literature competitions. After your tour drive to Kusadasi. Dinner on the Aegean Shore. Overnight at your hotel in Kisadasi. Today after breakfast leave back for Izmir. The journey is about 2 hours. On the way to Izmir stopover at Ephesus for a city tour. Ephesus: The city of Ephesus played a great role in the ancient times due to its strategic location on a very fertile valley. It was once a trade centre in the ancient world and also a religious centre of early Christianity. Terrace Houses: Located on the slopes of the Bulbul Mountain and well known as "The Houses of the Rich" as only wealthy people could afford to buy houses here. The terrace houses were known for the way they were built. The terrace houses were built in such a way that half the houses had terraces facing the east and the rest facing the west street. Archaeological Museum: A very rare and different designed museum from any other. It is not designed in a chronological order but in fact has been designed with a theme. A very rare and astonishing site to view. After a full day tour take some time for shopping in the Ancient city of Ephusus. Later continue your journey to Izmir. Evening at leisure. Overnight at your hotel in Izmir. After breakfast take a flight to Kayseri Airport. The journey is about an hour of flight. 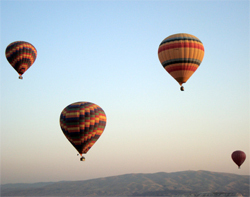 On arrival our representative will assist you with your transfer to Cappadocia and hotel check in. Cappadocia: A miraculous and unique nature wonder of the world. Known for its underground cities. Underground City: There are more than 40 underground cities but only 6 are open for public view. According to research these cities were used during the Bronze Age for protection and religious purposes. After your tour enjoy a dinner and dance show at a local restaurant. Overnight at your hotel in Cappadocia. Devrent Valley: Also known as an imaginary and pink valley. 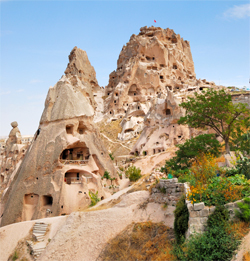 It does not have any cave churches like any other valley in Cappadocia. It revels different rock formations and has chimney forming lunar landscapes. Village of Avanos: A town set on the banks of Kizilirmak River which is also known as the red river and the longest in Turkey. Avanos is one for the main villages that gives supplies of clay for pottery and that is due to the river that gives the red clay. Some of the most famous potters are found here. 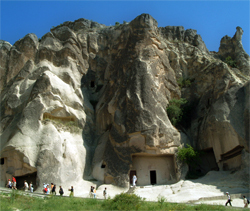 Goreme Open Air Museum: composed of refectory monasteries which each have their own rock cut churches. A site that no person should miss seeing. These churches belong to the 10th, 11th and 12th centuries. Rock Churches: Presents a unique example of rock hewn architecture and fresco techniques with some beautiful frescoes paintings. These paintings still retain a freshness that it had originally. Uchisar Castle: Situated on the highest point in Cappadocia. The top of the castle has a magnificent panoramic view. Most of the hollowed rooms in the rocks are connected to each other by stairs or tunnels. After you tour return to the hotel. Overnight at your hotel in Cappadocia. Today take a flight to Istanbul. The journey is about one hour. On arrival our representative will assist you to your hotel. Spice Bazaar: One of the oldest markets in turkey. Apart from spices you also get some gried fruits, nuts, seeds etc. are available. More than 88 shops just dedicated to spices. Bosphorus Boat Tour: Bosphorus means "crossing place of the Cow" and this name was given to it due to mythological reasons. It is much more than just a body of water and has a great historic importance to Turkey. Walk on the Beyoglu Street: A very European architecture, styles and customs came to turkey thru this street. A walk thru here will give you a feel of pure Europe. After your tour, return to the hotel. Rest of the day is at leisure. Overnight at your hotel in Istanbul. Transfer to Istanbul airport for your journey back home. 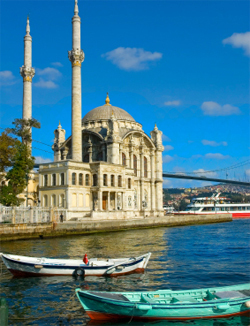 Platinumholidays.com specializes in cheap Turkey Tours and affordable Turkey Holidays. We offer packages with tours to Istanbul, to the Blue Mosque, to the Grand Bazaar, to Izmir, to Bergama, to Pamukkale, to Laodicea, to Aphrodisias, to Kisadasi, to Ephesus, and to Cappadocia. We have great deals to Turkey. Any type of tours to Turkey we have it. All our tours can be customized to meet your needs and they have connecting flights available from major cities in Canada. Plus our tours have Private Expert Guides and air conditioned vehicles.